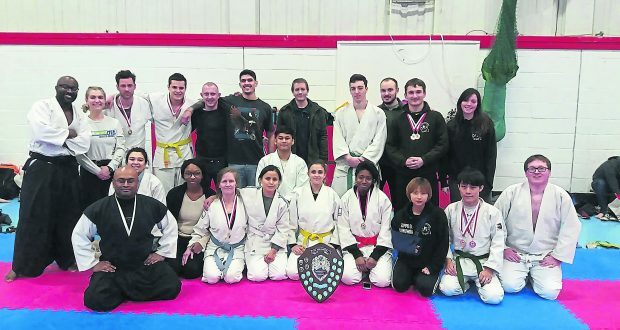 The Kingston jiu jitsu team won the national championship for the third year in a row, securing nine gold and four silver medals against more than 60 other universities. The Randori National championship, which took place in Northampton on February 24-25, is a traditional Japanese jiu jitsu competition arranged by The Jiu Jitsu Foundation (TJF). Club president Omer Awan said: “When people ask ‘What club are you from?’ and you answer Kingston, people know about our reputation and our instructor. They know that when we come, we bring it. The competition, which had around 450 participants, focused mostly on grappling which means that the participants must wrestle their opponent to the ground and pin them for 30 seconds in order to win. Among the newcomers who secured one of Kingston’s gold medals was Adeel Sheikh, who tore his shoulder muscle in the final but still managed to win the fight. Sheikh said: “I have been a fighting fan for a while so when I first came to university, this was the martial arts team that I found. Team coach, Saeed Jabbar, has been coaching at Kingston since 1999 and is himself a Kingston graduate. “I think it was very well done, particularly by the new people who did a very good job,” he said. What distinguishes jiu jitsu from other martial arts from other martial arts is that it is purely based on skills and technique and does not require you to have a specific build like in a lot of other martial arts. This makes it a very inclusive sport that anyone can participate in. Awan said: “It is based on a lot of pure mechanical physics and you do not need to be the biggest, toughest guy to win in jiu jitsu because it is not an attribute-based martial art. “For example, in taekwondo, you need flexible legs, in muay thai you need long limbs and if you are boxing you need broad shoulders.